Nguyen Ha Hotel balances budget price with the comfort that backpackers look for: clean linens, separate shower stall and a mattress that’s not rock hard. Other perks include a vanity, fridge, decent pillows, wall mounted flatscreen TV with a few English channels, good lighting, as well as WiFi and air-con. Hot water does take a while to arrive to the shower but once it does, it’s toasty. The hotel is walking distance to Back Beach and the weekday price is a bargain. However, they gouge on the weekend – it is double the price – and they get away with it because they are usually full. If you want to stay here on the weekend, then book ahead. The room itself is great. But Nguyen Ha does come with some significant caveats that spoil the fun for guests. There is zero English spoken, and during our stay we found staff to be unfriendly and simple requests like a taxi were a frustrating exercise. The receptionist overcharged us for the minibar drinks and refused to give us a receipt. The hotel is a skinny one and therefore it has small hallways. They echo loudly and our neighbours were a circus, shouting in the halls/gambling/partying until 02:00, and the receptionist refused to do anything about it. Hopefully you will have better luck than we did. They charge 200,000 dong per day for a motorbike rental, which is pricey considering other guesthouses charge as little as 100,000 dong. If you can live with lacklustre service then this is a good pick that puts you less than 200 metres from Back Beach. It’s great for the price on a weekday. Double-check their math and the charges. Last updated on 17th April, 2016. Check rates at Nguyen Ha Hotel on Booking.com. 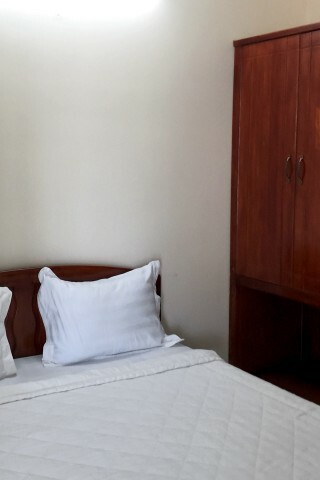 Room: Standard double room, low season: 310,000 dong, high season 680,000 dong. Notes: High season is Fri/Sat nights. Room: Quad air-con private bathroom, low season: 420,000 dong, high season 990,000 dong. Notes: High season is Fri/Sat nights.